SAO PAULO (AP) — Leaders in Brazil's two biggest cities said Wednesday that they reversed an increase in bus and subway fares that ignited anti-government protests that have spread across the nation in the past week. Many people doubted the move would quiet the demonstrations, which have moved well beyond outrage over the fare hikes into communal cries against poor public services in Latin America's biggest nation. "It's not really about the price anymore," said Camila Sena, an 18-year-old university student at a protest in Rio de Janeiro's sister city of Niteroi. "People are so disgusted with the system, so fed up that now we're demanding change." Sena added that seeing money poured into soccer stadiums for the current Confederations Cup and next year's World Cup only added fuel to the people's anger. "It's not that we're against the World Cup, not at all. It will bring good things for Brazil. It's just that we're against the corruption that the World Cup has become an excuse for," she said. At a press conference in Sao Paulo to announce the reversal of the public transport fare hike, Sao Paulo Mayor Fernando Haddad said it "will represent a big sacrifice and we will have to reduce investments in other areas." He didn't give details on where other cuts would occur. Rio de Janeiro Mayor Eduardo Paes also confirmed that the fare increase would be rescinded in that city. Scattered street demonstrations continued in some parts of Brazil, including Niteroi, as protesters demand improvements of the public services they receive in exchange for high taxes and rising prices. Small groups of protesters clashed with police in Niteroi late Wednesday, while demonstrators staged a large march in the capital of Brasilia that included a new demand that the government provide free transit services. Earlier in the day, about 200 people blocked the Anchieta Highway that links Sao Paulo, the country's biggest city, and the port of Santos before heading to the industrial suburb of Sao Bernardo do Campo on Sao Paulo's outskirts. Another group of protesters later obstructed the highway again. In the northeastern city of Fortaleza, 15,000 protesters clashed with police trying to prevent them from reaching the Castelao stadium before Brazil's game with Mexico in the Confederations Cup soccer tournament. Riot police used gas bombs and pepper spray to keep protesters from advancing past a barrier some 3 kilometers (1.8 miles) from the stadium. A police car was burned by demonstrators, who also threw rocks and other objects at officers. The protest disrupted fans' efforts to get in the stadium for Brazil's second match at the World Cup warm-up tournament. "We are against a government that spends billions in stadiums while people are suffering across the country," said Natalia Querino, a 22-year-old student participating in the protest. "We want better education, more security and a better health system." Earlier, hundreds of protesters cut off the main access road to the stadium, and police responded by diverting traffic away from the road. Official vehicles of the international soccer organization, FIFA, were among those struggling to reach the stadium. In the city of Belo Horizonte, some 2,000 protesters took to the streets in a peaceful demonstration, while protesters were reported gathering in Niteroi, across Guanabara Bay from Rio de Janeiro. 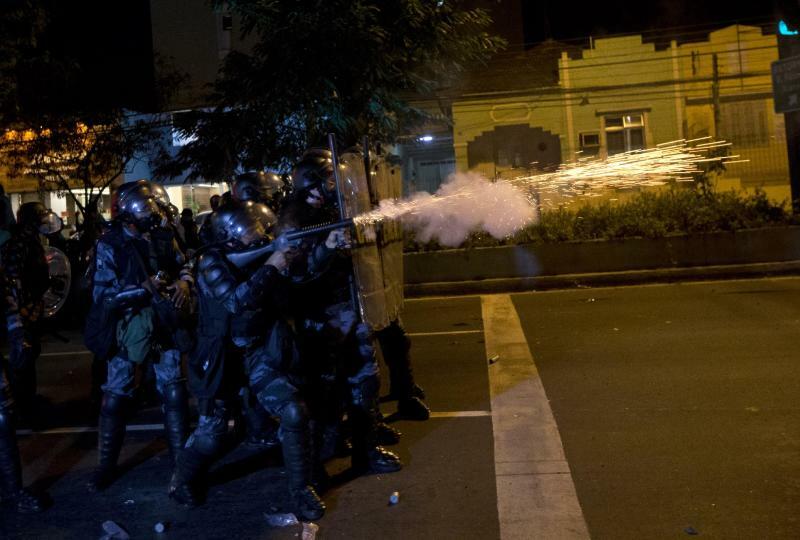 The actions followed another night of mass marches around Brazil and nearly a week of unrest that has shocked the country's leaders ahead of a papal visit next month and next year's World Cup soccer tournament. Beginning as protests against bus fare hikes, the demonstrations have quickly ballooned to include broad middle-class outrage over the failure of the government to provide basic services and ensure public safety, even as Brazil's economy modernizes and tax rates remain some of the highest in the world. Protest organizers, who have widely employed social media, called for mass demonstrations Thursday in Sao Paulo and Rio, the country's two biggest cities. The Rio action promised the most volatility, with protesters planning to march to Maracana stadium where Spain and Tahiti are to play in a Confederations Cup match. Police said they would not allow protesters to interrupt the game. Soldiers from Brazil's elite National Force have been sent to Fortaleza, Rio, Belo Horizonte, Salvador and Brasilia to bolster security during tournament games. FIFA President Sepp Blatter urged protesters to stop linking their anger against the government to the Confederations Cup. The cost of building stadiums for the FIFA tournaments has been a regular complaint at marches. On Tuesday night, tens of thousands of Brazilians flooded central Sao Paulo, with the protest following the rhythm of mobilizations that drew some 240,000 people across Brazil the previous night. Though mostly peaceful, small bands of radicals split off in Sao Paulo to fight with police. Fernando Grella Vieira, head of the Sao Paulo state public safety department, said 63 people were detained during Tuesday's protests. He told Globo TV that police would guarantee the right to demonstrate but would "repress all forms of vandalism." Police said those arrested had looted stores during the protest in downtown Sao Paulo and were caught running away with clothing, TV sets, microwave ovens and computers. TV footage showed protesters breaking into shuttered newsstands and stealing cigarettes and candy. Other images showed demonstrators smashing windows of banks and stores. Beyond complaints about transit fares, protesters haven't produced any concrete demands even as they've waved signs, gone on social media and chanted their anger at the entire governing system. A common cry at the rallies: "No parties!" "What I hope comes from these protests is that the governing class comes to understand that we're the ones in charge, not them, and the politicians must learn to respect us," said Yasmine Gomes, a 22-year-old squeezed into the plaza in central Sao Paulo where Tuesday night's protest began. President Dilma Rousseff, a former leftist guerrilla who was imprisoned and tortured during Brazil's 1964-85 dictatorship, has hailed the protests for raising questions and strengthening Brazil's democracy. "Brazil today woke up stronger," she said in a statement Tuesday. Yet Rousseff offered no actions that her government might take to address complaints. The protests have raised troubling questions about the country's ability to provide security ahead of it playing host to some of the world's biggest events, including the 2016 Olympics in Rio. Mass protests are rare in this 190 million-person country, with demonstrations generally attracting small numbers of politicized participants. Many now protesting in Brazil's streets hail from the country's growing middle class, which government figures show has ballooned by some 40 million people over the past decade amid a commodities-driven economic boom. The protesters say they've lost patience with endemic problems such as government corruption and inefficiency. They're also slamming Brazil's government for spending billions of dollars to host the World Cup and Olympics while leaving other needs unmet. A November government report raised to $13.3 billion the projected cost of stadiums, airport renovations and other projects for the World Cup. City, state and other local governments are spending more than $12 billion on projects for the Olympics in Rio. Associated Press writers Stan Lehman in Sao Paulo, Jenny Barchfield and Rob Harris in Rio de Janeiro, Marco Sibaja in Brasilia and Tales Azzoni in Fortaleza contributed to this report.